I am happy to announce Chyan's first new stamps for 2018. 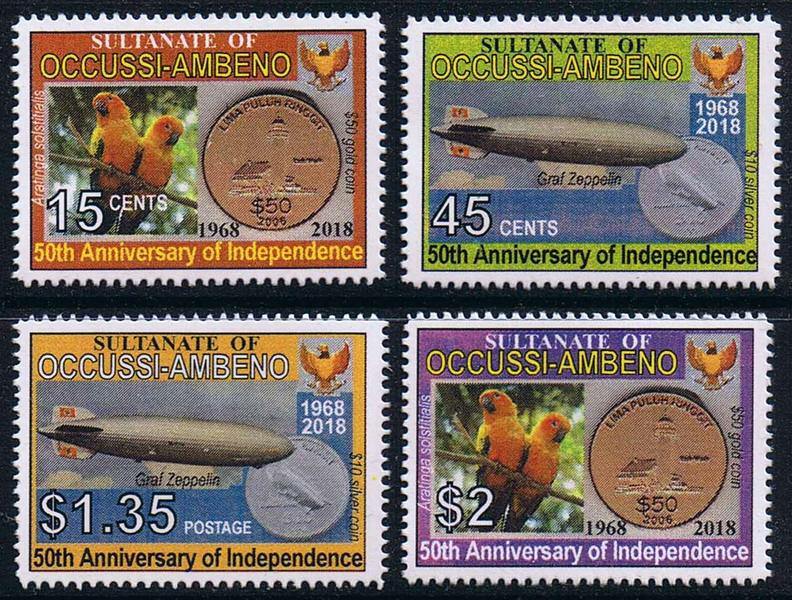 The set of two (issued on 8th April 2018) celebrates the 50th anniversary of independence of Occussi-Ambeno. A most noteworthy event in the Fifth World, and an anniversary that few expected to see! The designs feature gold and silver coins of Occussi-Ambeno, as well as a pair of sun parakeets on the 15 sen stamp, and the airship "Graf Zeppelin" on the 1.35 Mon. Chyan 2018 Fiftieth Anniversary of Independence of Occussi-Ambeno set. Coins of Occussi-Ambeno are shown along with sun parrakeets and the "Graf Zeppelin" airship. LZ 127 Graf Zeppelin (Deutsches Luftschiff Zeppelin #127; Registration: D-LZ 127) was a German-built and -operated, passenger-carrying, hydrogen-filled, rigid airship which operated commercially from 1928 to 1937. 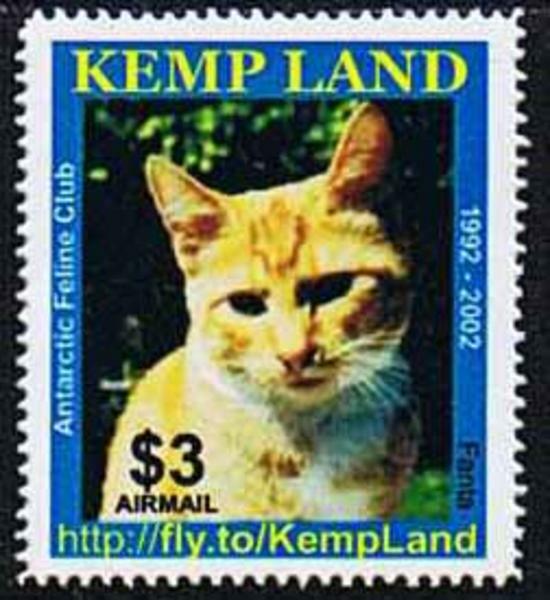 When it entered commercial service in 1928, it became the first commercial passenger transatlantic flight service in the world. It was named after the German pioneer of airships, Ferdinand von Zeppelin, who was a count (Graf) in the German nobility. During its operating life, the airship made 590 flights covering more than 1.7 million kilometers (over 1 million miles). It was designed to be operated by a crew of 36 officers and men. The LZ 127 was the longest rigid airship at the time of its completion and was only surpassed by the USS Akron in 1931. It was scrapped for fighter plane parts in 1940. Occussi-Ambeno 2018 Half a century of independence and stamp and coin issuing. 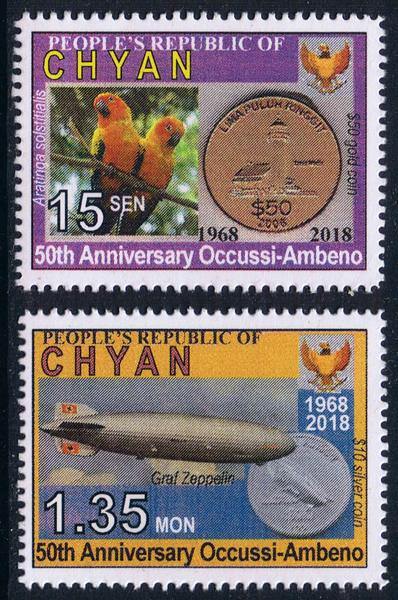 Occussi-Ambeno celebrated its 50th birthday on 8th April 2018, and this attractive set was issued. The designs include sun parrakeets, the country's $50 gold coin, the airship "Graf Zeppelin", and the $10 silver coin which also depicts a zeppelin airship. Occussi-Ambeno was a former Portuguese colony, which became independent on 8th April 1968. 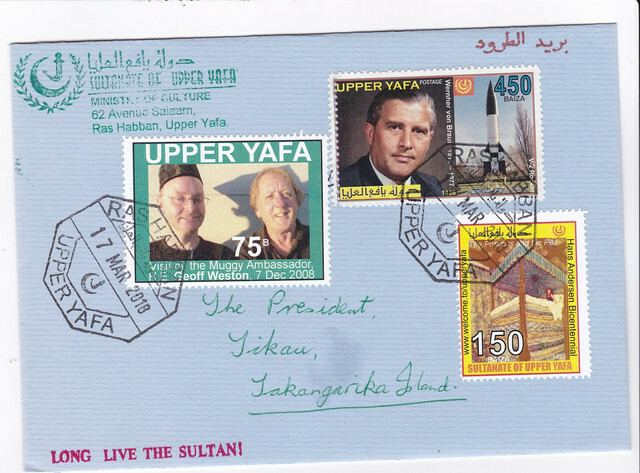 Stamps have been issued since then. Okusi-Ambeno security forces comprise a single battalion of the Palace Guard. The Sultanate maintains bilateral mutual-aid defence arrangements with Brunei, Sedang, Taiwan, the Vatican, and the Hutt River Province, and an arms supply and maintenance contract with Singapore. The Council of Ministers is appointed by and presided over by HM the Sultan. The seat of government is the Istana Iskandar (Alexander Palace). Pujangga Istana: Her Most Excellency May Wanhamid.